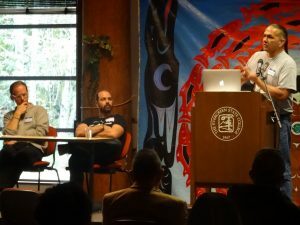 The 1st annual Indigenous Climate Justice Symposium was held on November 5-6, 2015, in the Longhouse Education and Cultural Center at The Evergreen State College, Olympia, Washington. See the photo album. 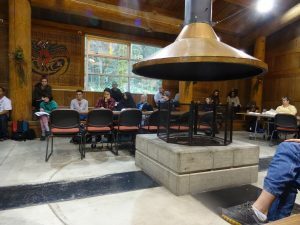 We acknowledge that The Evergreen State College is on the ceded territory of the Medicine Creek Treaty Tribes (Squaxin Island, Nisqually, Puyallup) and that as a state institution, we have a responsibility and obligation to engage and consult with Washington tribal nations in our educational work, in keeping with the 1989 Centennial Accord and 1999 New Millennium Agreement. 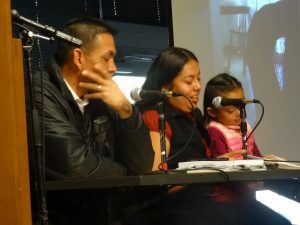 Pah-tu Pitt (MES graduate, Warm Springs Environmental Specialist and Education Coordinator), Addressing Food Sovereignty through Access to Wi’wnu (Huckleberries): A Case Study of the Warm Springs Indian Reservation. Candace Penn (Alumni, Quileute/Squaxin I.) and Kezia Wentworth (Undergraduate, Squaxin I. ), The Squaxin Island Community Garden Project. 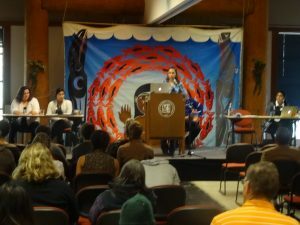 Brittany Reed (Tribal MPA), Food Sovereignty. Matthew Fuller (MES), Lummi Totem Pole Journey. Graham Clumpner (MES), Shell No! Actions and Alliances. 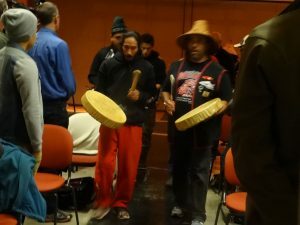 Nisqually Canoe Family drum group, Opening. 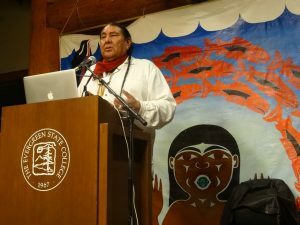 Keynote by Tom B. K. Goldtooth, Indigenous Environmental Network Executive Director, on “The Paris Climate Accord: Will it be a Crime Against Humanity and Mother Earth? Evergreen President George Bridges, Welcome. Fawn Sharp. President of Quinault Indian Nation and Affiliated Tribes of Northwest Indians (ATNI), on the three proposed Grays Harbor oil terminals. Jeremiah “Jay” Julius. Lummi Nation Councilmember, on the proposed Cherry Point coal terminal. Adriann Killsnight. Northern Cheyenne tribal member, Ecoregional Ethnographic Assessment Project, on planned Otter Creek coal mine & Tongue River Railroad in SE Montana. Jay Julius and Adriann Killsnight, with Beth Doglio (Power Past Coal). Adam Osbekoff (Aleut), Snoqualmie Tribe Cultural Resource Compliance Manager, Freddie Lane (Lummi), Hank Adams. Kandi Mossett, with Arnie Martin and Jude Armstrong (Citizens for a Clean Harbor). Tom B. K. Goldtooth (Mato Awanyankapi) is executive director of the Indigenous Environmental Network (IEN), based in Bemidji, Minnesota. He is Diné (Navajo) and Dakota (Sioux). From a Native student leader in 1971 at Arizona State University to a military tour in the US Army to developing Native programs in social services, Tom has applied his professional academic training in social work practice (from Pacific Lutheran University) to build sustainable community development. His environmental justice leadership in the First National People of Color Environmental Justice Leadership Summit in 1991 in Washington D.C. has continued to the UN’s Permanent Forum on Indigenous Issues in 2009 and is a member of the International Indigenous Peoples Forum on Climate Change that operates as the Indigenous caucus within the United Nation Framework Convention on Climate Change (UNFCCC). He co‐produced an award-winning documentary film, Drumbeat for Mother Earth, which addresses the affects of bio‐accumulative chemicals on Indigenous peoples. 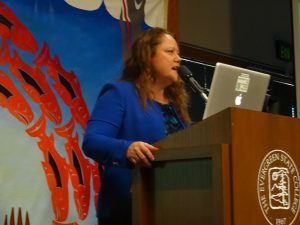 Fawn Sharp has been the President of the Quinault Indian Nation since 2006, and was reelected to a fourth term in 2015. She is an attorney with an academic background in Criminal Justice. She holds an advanced certificate in International Human Rights Law from Oxford University. President Sharp formerly served as Managing Attorney and Lead Counsel for the Quinault government, and Associate Judge and as an Administrative Law Judge for the Washington State Department of Revenue Tax Appeals Division. 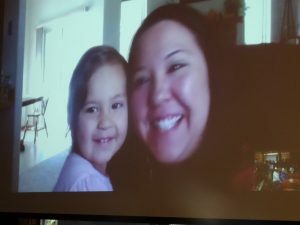 While President of Quinault, Ms. Sharp was elected by the 57-member government organization, the Affiliated Tribes of Northwest Indians (ATNI) as their President in 2011, and serves as the Northwest Regional Vice President for the National Congress of American Indians (NCAI). She completed two years of service as Chairman of the US Department of the Interior Secretarial Commission on Indian Trust Administration and Reform. Kandi Mossett is Mandan, Hidatsa and Arikara from the Fort Berthold Reservation in North Dakota. She graduated from the University of North Dakota’s Earth Systems Science and Policy Program in 2006. She began working for the Indigenous Environmental Network as the Tribal Campus Climate Challenge organizer in 2007, engaging with more than 30 tribal colleges to support initiatives within tribal colleges that connect students to environmental justice and climate justice issues in their communities in line with Indigenous traditional knowledge and belief systems. She also served as IEN’s Native Energy & Climate Campaign Organizer. Jeremiah “Jay” Julius (Sle-lh’x elten) is an Officer (Secretary) of the governing body of the Lummi Indian Business Council, the governing body of the Lummi Nation. He was instrumental in moving the Lummi Nation to a firm “No” position regarding the proposed coal terminal at Cherry Point (Xwe’chi’eXen). He was later appointed leader of Xwe’chi’eXen Operational Team that is responsible for protecting Xwe’chi’eXen and the surrounding waters. As a fisherman and crabber, he understands the importance of fishing for the way of life and heritage of the Lummi people. He has been a successful private entrepreneur and accumulated a wealth of business experience. He currently shares his passion for business, self-improvement, and leadership through his Life Coaching practice. Adriann Killsnight (He’heenóhká’e), is a Northern Cheyenne tribal member and owner of Blackbirdwoman Contracting & Environmental Consulting, in Lame Deer, Montana. Presently, Mrs. Killsnight is the Technical Coordinator for the Northern Cheyenne Tribe’s Ecoregional Ethnographic Assessment Project, a collaborative effort with the Northern Cheyenne Tribe, Chief Dull Knife College, and US Bureau of Land Management. Mrs. Killsnight received her M.S. in Resource Management from Central Washington University, and her B.A. in Environmental Studies from Montana State University. Symposium sponsored by the Climate Change and Pacific Rim Indigenous Nations Project, and hosted by the program Resource Rebels: Environmental Justice Movements Building Hope, with support from the Graduate Program on the Environment (MES), Master of Public Administration – Tribal Governance, Native Programs planning unit, Sustainability and Justice planning unit, President’s Diversity Fund, Academic Deans’ Office, Center for Community-Based Learning & Action (CCBLA), Clean Energy Committee, Clean Energy Education, Research, and Action (CEERA), and Evergreen programs Engaging with the Endangered Northwest, Shipping Out and Writing Home, Caliban and the Witch, Even When Erased We Exist, Graduate Conceptualizing Our Regional Environment, and Introduction to Environmental Studies. Special thanks to the Native Student Alliance, the Longhouse Education and Cultural Center, the students of the Resource Rebels and Graduate Program on the Environment programs, and the Cultural Group at the Cedar Creek Corrections Center (Littlerock). Thanks to Todd Boyle for producing the videos.